Sometimes, in order to make changes happen, you need a strong conviction to take extreme measures and risks. The Kaziranga National Park has done just that. Seeing the importance of conserving its wildlife, it has opted to implement a very controversial policy that will definitely make people take a step back and reconsider. Kaziranga National Park is hailed as a world heritage site by UNESCO, is a wildlife sanctuary for one-horned rhinoceroses. When the park was founded in 1908, there were only a handful of rhinos being protected but a century later, it is now home to more than 2400 Indian one-horned rhinos, which is approximately two-thirds of the total world population. Located in the edge of the Eastern Himalayan biodiversity hotspots, Kaziranga has become a haven and breeding ground not just for rhinos but for all sorts of wildlife including tigers, elephants, wild water buffalos, and swamp deer. It is also recognized as an Important Bird Area by BirdLife International for its conservation of avifaunal species. However, achieving these feats wasn’t an easy task and the approach that they have used is quite controversial. The Rangers have been given the authority to shoot and kill suspected poachers on site. According to Avdesh, who works as a ranger in the park, “The instruction is whenever you see the poachers or hunters, we start our guns and hunt them.” He further explained, “[We are] Fully ordered to shoot them. Whenever you see the poachers or any people during night time, we are ordered to shoot them.” Avdesh has shot at people twice in his four years at the park but admitted that he has never killed anybody. But he is confident that whenever the opportunity arises, he will not have to face consequences if he did. This confidence that the Rangers have in carrying out these orders with impunity finds its basis on the support and approval that the government has granted to them in using these extreme measures. They have essentially been given the power to carry out “extrajudicial executions” and have the immunity from prosecution because they are merely trying to conserve its wildlife and resources. Dr. Satyendra Singh, the park’s director, shares the difficulties in addressing and resolving the issue of poaching in the park. Their approach may seem reckless at first but how people would imagine their implementation of the policy may not accurately describe the way Dr. Singh tells the rangers to deal with suspected poachers. It is not exactly shooting anything that moves without any hesitation. He describes their method as such, “First, we warn them – who are you? But if they resort to firing we have to kill them. First, we try to arrest them, so that we get the information, what are the linkages, who are others in the gang?" There have already been 50 poachers killed in the past three years. Locals, who have been recruited by the gangs because who attracted them to the lucrative trade, are the ones who help the poachers infiltrate the park. However, the difficult part is that these poaching gangs employ shooters who come from neighboring states which makes monitoring the situation difficult. Poachers have their sights set on the incredibly expensive rhino horn which is being sold as a miracle cure in places like Vietnam and China. They can be sold for as much as $6,000 for 100g. More than that, despite having smaller horns than African rhinos, Indian rhinos are being marketed to be far more potent. Nonetheless, to what extent should we go in order to protect these endangered species? Though it may have proven to be an effective way to protect the endangered rhinos, there are some concerns about the rising number of deaths, particularly the locals who may not even be part of the poaching gangs. At some point, park rangers averaged two people killed in a month. In fact, there were more people killed in 2015 than there were rhinos poached. Innocent villagers were getting caught in the crosshairs as shown when a disabled boy herding cow was shot. Until people realize the value of conserving and preserving natural resources, poaching and other harmful and illegal activities will continue to thrive. If we don’t adopt more sustainable practices, it won’t be long before endangered species become extinct. There are ways for us to make use of these resources without threatening wildlife and causing an imbalance in the ecosystem. 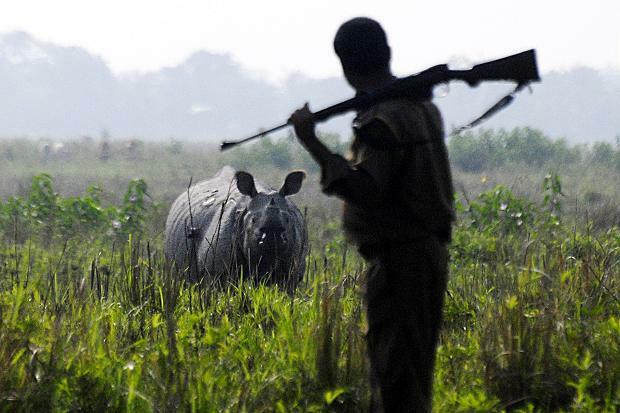 For now, other wildlife sanctuaries and parks throughout the world may consider implementing policies similar to Kaziranga to discourage hunting activities that are detrimental to wild animals. Only time will tell if there comes a point when we don’t have to use such extreme measures to protect our world.